Here's an oddity: the Silver Pavilion doesn't have a trace of silver on it. When the temple was built in the 1480s as a retirement home for the then shogun, the plan was for it to be coated in silver leaf. Scholars believe he ran out of money before they got to that part of the project. And when he died a few years later, the silver-less pavilion was converted into the Zen temple it is today. Though the temple itself is small and unassuming  a Spartan version of its illustrious golden cousin Kinkaku-ji  the reflective pond and manicured trees, the raked sand garden, and the mossy, wooded hillside to the east, from where you can see Ginkaku-ji holding back a sprawling, low-rise urban backdrop, all combine to make a spectacular whole. 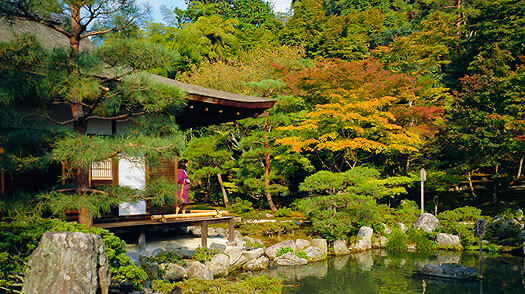 Ginkaku-ji can be reached from Kyoto Station by bus numbers 5, 17 and 100. Get off at the Ginkaku-ji Michi bus stop. Admission is ¥500 and it is open daily 8.30am to 5pm (9am to 4.30pm from Dec to Feb).